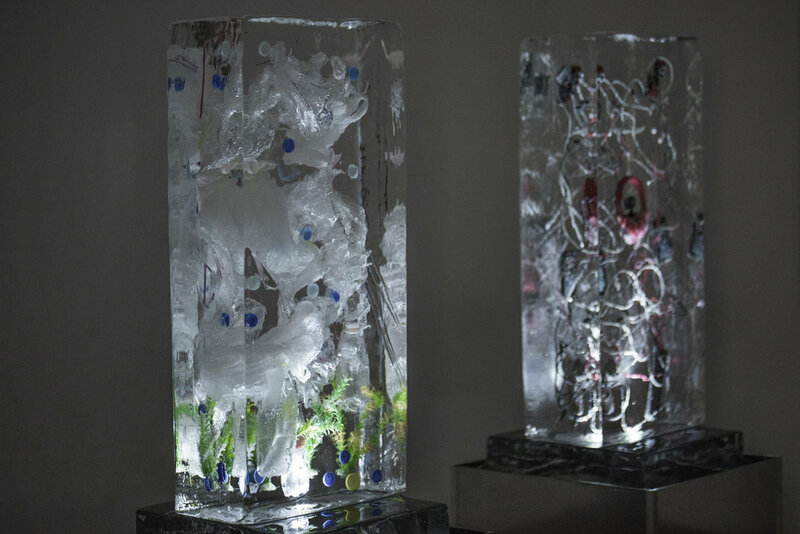 "Time Capsules - Ice Objects" is an ephemeral set of six ice objects, measuring 100x50x25cm each. Unlike traditional time capsules, which have the task of long-term storage of items or information, the function of these containers have been replaced by unstable ice, which is not expected to be analyzed by archaeologists, anthropologists, and historians. The information contained therein is intended for us, here and now, recalling that we are dealing with important events that affect our lives and successive generations. In each were frozen objects of public use, which are meant to indicate multidimensional, both temporal and spatial, universal issues and problems of the contemporary world. Based on subjective observations, they concern the current socio-environmental changes that are the result of civilization development. 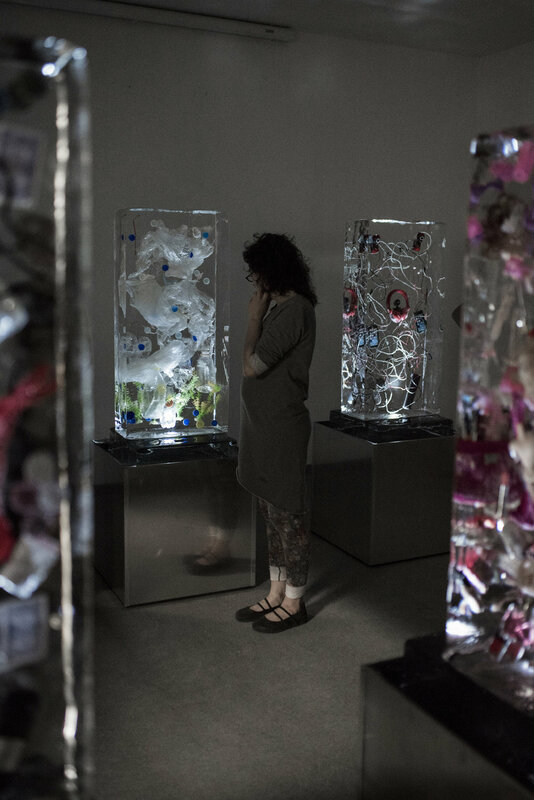 They symbolically address topics such as surveillance, communications, capitalism, addiction, social trends, human emotion, power, and the impact of recycling and consumer culture. Big Brother - examining the spectrum of possibilities that new audio-visual techniques provide us with while analyzing the likely consequences of this, including the evolving culture of voyeurism and the mass phenomenon of digital surveillance. Big Pharma - a reference to conspiracy theories of pharmaceutical corporations, whose main purpose is to seek maximum economic benefit at the expense of the patients' health. A presentation of corporate construction techniques. Plastic - an overview of the effects of inadequate management of plastic waste that accumulates in oceans and endanger marine and terrestrial ecosystems. The Cult of Beauty - an analysis of the sexualization of women and girls and the process of striving for unattainable and/or imaginary beauty canons, induced by trends and/or social pressures. A look at the role of the media in this process and the effects it brings. Addiction - an attempt to understand the causes of addiction and draw attention to the forces behind its increasing occurrence. Fast Food - a discussion of the phenomenon of this rapidly developing instant culture and its consequences. 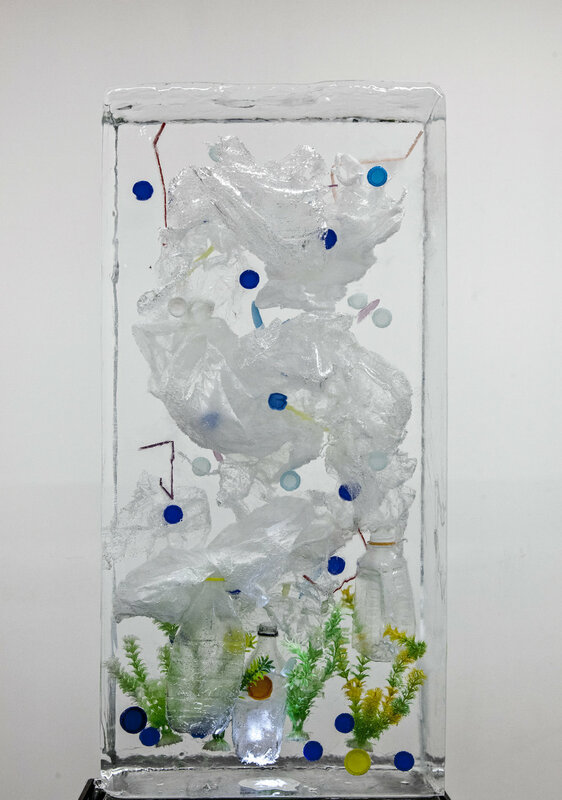 In this work, I would like to pay attention to the issues of recycling and consumer culture as well, and for all to realize what happens to these objects when they are no longer needed and lose value for us. The inspiration behind the project was a contemplation of the concept of time and events that I consider to be symbolic for our time. The ice object used in this work are the means of communication between me and the recipient, in order to project subjective views, perceptions and emotions connected with it. The purpose of creating this work is a desire to provoke the recipient to reflection and arousal, interwoven with an informational and educational thread. Directness and simplicity of message as well as the type of means used is conditioned by the desire to create a universal work that has a chance to reach a wide audience. Despite the conceptual nature of the set, it does not contain references to art history or other artists' works. The message has a straightforward character and I hope that it will be equally legible and understandable. Part of BA Defense Diploma at The Academy of Fine Arts in Wroclaw, Poland - defended with honors. Promotor: prof. Ryszard Jędroś & assistant Agnieszka Jarząb. The works on the project took about 6 months to complete. 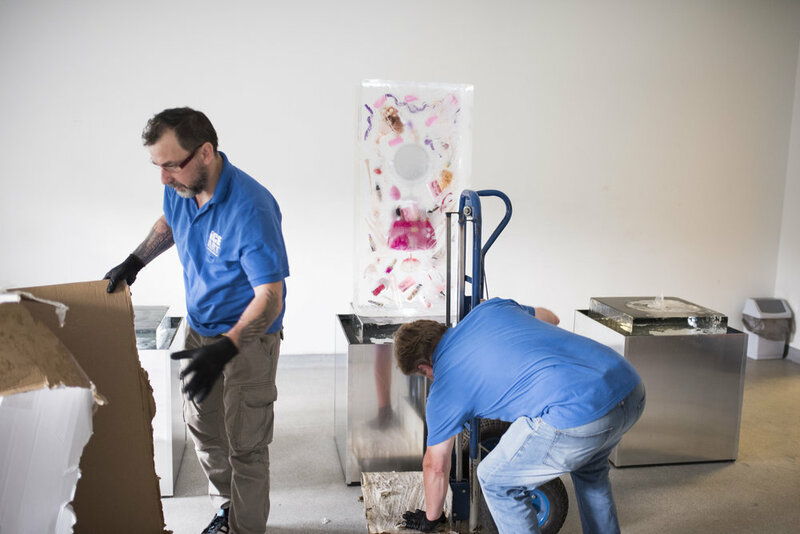 Thanks to cooperation of Ice Art company located in Wroclaw, Poland, for two continuous days the objects were placed to freeze layer by layer, each object carefully placed one by one. Afterward, it was stored at the company's coolers for some weeks and finally arrived on the day of the presentation. Each object weights about 130kg and with dimensions 100cm x 50cm x 25cm. Defreezing time depending on the outside temperature takes about 8-12 hours to melt down. Photo credits: Anna Tokarska, Agata Piątkowska, Maciej Pazera, Łukasz Wdowik. Short interview on Polish Radio, Channel 4, "Artistic Runway/Artystyczny Wybieg": starting at 38:32min. Recorded in Polish. Unfortunately, there is no translation available at this time.